I have separated this guide from the beginners guide since it is in essence not for beginners. And it's kind of long so it deserves its own space. In essence, Ortho4XP is a standalone program and it generates the photorealistic tiles within its own file structure (unless told otherwise). You only transfer the generated folders to your custom scenery folder and to uninstall them simply delete those folders. The bin folder, circled in Black, is where you'll find the .exe which you'll open to set up and make imagery. We recommend doing this step first if you have an area that you wish to create that consists of more than one tile. It is also the more “automated way” of creating tiles since you don’t have to follow the steps. You can later customize the tiles if you leave a copy of your created tiles in the Ortho tiles folder.Choose base source and Zoomlevel in the “Provider and Zoomlevel" section.Start with BI (BING) and ZL 16. If you select a zoom level higher than ZL16, we recommend doing as a custom tile for specific areas unless you know you will be flying GA close to the ground. You can “edit” the tiles after this step. ZL16 is good at 1000 feet and above.You might also want to consider increasing the mask_width (20 is preferable). This adjusts beaches to merge better into the oceans and avoid sharp edges. 20 might be too much for some areas – tweak this later when you get the hang of creating tiles. ZL16 is good at 3000 feet and above. (Personal preference gnome appears and says it’s all about personal preferences…) Higher than ZL16 I recommend doing as a custom tile for specific areas unless you know you will be flying GA close to the ground. You can “edit” tiles after this step. in the “Provider and Zoomlevel section. 1. CLICK ON "EARTH TILE MAP"
You always do this as a second step after source and zoom level to choose what area you want to create. while still in the Earth tile map. 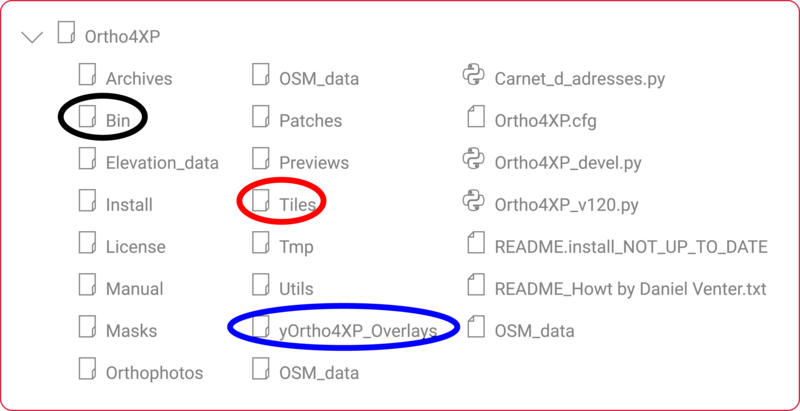 Ortho4XP will now build your first tiles! You can close the map window and observe that Imagery has begun creating tiles in the white field on the right side. This may take some time. It may also show connection fails and try to reconnect which usually works. This is normal since the providers have built in security against server hammering. Server hammering cal lead to an IP ban if you do it excessively. The ban normally is for 12-24 hours, but you may risk a life ban of your ip-address if you are reckless. 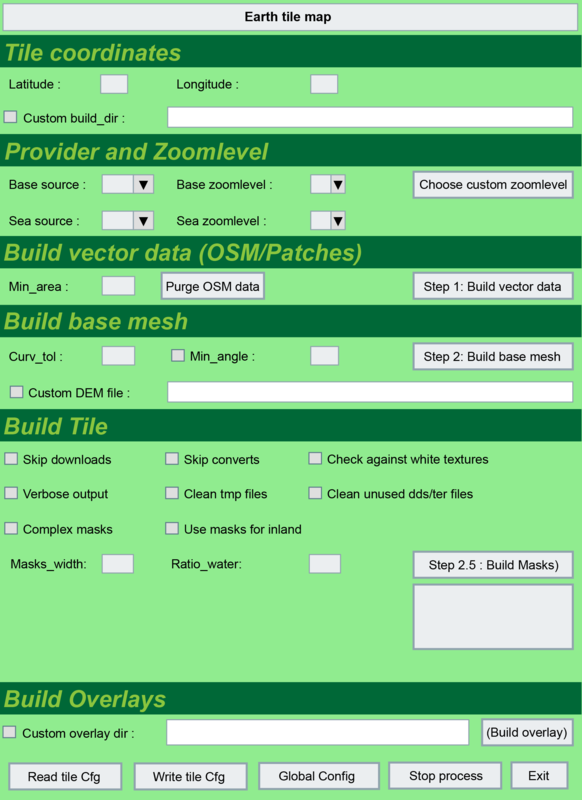 Choose area in earth tile mapChoose zoom level and base source (custom zoom level if wanted)Set mask width (further down)Now go step by step until Build Tile. For each step you will see Ortho working in the white field on the right. Choose area on the Earth Tile map (close the map afterwards)Click Choose custom zoom level a new window pops up with a blank area on the right. This is where your map comes up later. Choose zoom level and use Shift+left click to define an area.For each finished area press save – when finished: save and exit the preview map. Now you will have to continue with the singe tile procedures but if the tile is already created in an earlier session and it is present in your Ortho tiles folder then you only need to press the build tile button. In the picture below I have created four different zones. Base ZL is 16. 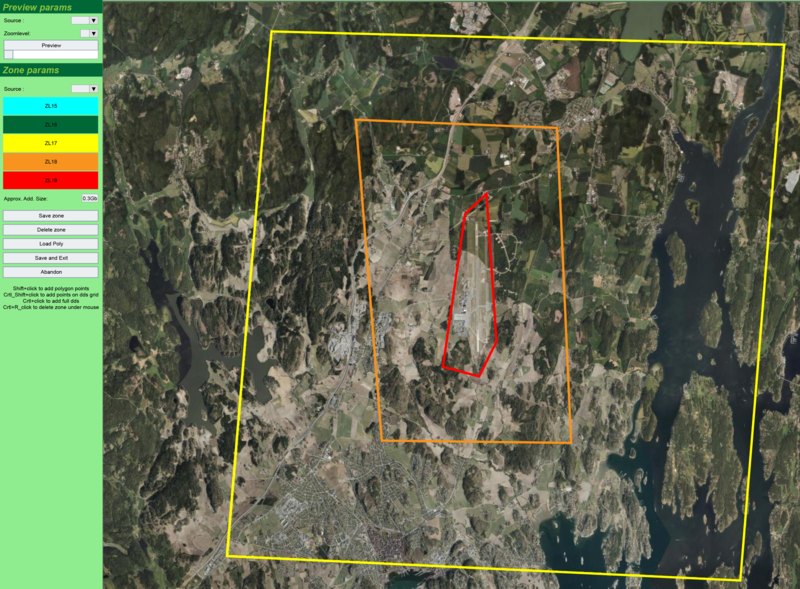 Then I have a wide area with ZL17, a closer one with ZL18 and the airport itself is ZL19. This way you save space by not making whole tiles at high zoom levels and you save a lot of time as well. Size per tile: 2-3GB depending on amount of water/landHigher zoom levels will demand more time for completion and more space! Note: A ZL17 has 4 times the sections of a ZL16. ZL18 four times the sections of a ZL17 and ZL19 four times of ZL18. So yeah... you'll be stuck converting tiles a lot. On a regular HDD this takes a lot more time than on a SSD too. On top of that the connection to the provider might not give you the full speed of the download despite your connection being a good one. I don't copy my tiles. If I want to store them, I move them to a separate folder for storage. When I use the tiles I just make shortcuts of each tile. That way I never have double sets of tiles anywhere in my system. Cloud correction comment: (for advanced Photoshop users) Find the tile in the jpeg saved folder and edit the part of the tile with clouds. ( /Ortho4xp/Orthophotos ) Find another aerial photo and paste, allign and blend it in. When that is done delete the section of the tile and redo it without downloading images - letting ortho convert the edited part of the tile. || Explanation: "Curvature tolerance" or how much you accept a tolerance for the curvature when you build mesh, so if there is more curvature tolerance means your mesh is less complex. Example a mountain curvatures will be roughly constructed because you are inserting a high value for curv_tol, you are allowing more rough curvatures in the mesh whereas when you put lower values you will have smoother mesh => more complex and less rough curvature. || Tip: You can check if the provider of your choice is of good quality by opening the custom zoom level (after choosing area in the Earth tile map) and choosing the provider (source) there and press preview. Zoom level under the source shows preview zoom level (max 13). Look for color mismatches and clouds. Choose provider and Base zoom level. If you prefer a video of the step by step guide check out the Simulation Channel Deluxe's video here. Did I forget something? Remember that this is meant for beginners who just joined our ranks and not a in-depth guide on how to code a parallel matrix. I am making this one in response to the many new members coming in to the facebook page XPNG where I am on the admin team. I don’t want to overwhelm anyone but not leave essentials out so any feedback will be greatly appreciated.